Mloy, I have purchased the Cobra Restorers printed plans several years ago. After this I decided to go with a simpler set of plans and have just finished my first cobra chassis. When I finish the rest of the car, I would like to try my hand at an original chassis build. Is it possible to get a copy of the 289 plans you have? Iggy that's not fair, put some pics in your gallery we wanna see! Mickmate, too true. With one kid in college etc, all I will be able to afford to do for a while is take pictures. I try this tonight, but will be experimenting. John, PM me your address and I'll send out all the drawings, pictures and notes that I have. The drawings are in AutCAD so you'll need at least a reader to see them or you may be able to get them plotted out somewhere. All I ask is that you say nice things about me and maybe a few dollars if you feel so inclined. Mick, I've been lurking every now and then to make sure y'all are OK. The fastback goes for paint next month and I've been working on the motor since it sustained a little damage from the drag strip last October. Only just read your replies because of computer crash at home. Mark I have ACad and work with catia, so any drawing format or pdf will be great. I would appreciate anything you can send me on the leafsprung 289. As it happens I made contact with cobrachuck some time ago and have bought a set of drawings from him. but I won't see them till March as I am in Germany working at the moment. Are you happy with your 289 build? I still need to learn a lot about the slab side 289. I'll send you my email address direct. Reviving this thread does anyone have any pixs of Klaus Arning's 427 Cobra IRS. From what I have read it's similar to the Mustang1/Falcon. I read some old articles posted at CTM Engineering's site. Provided link has some good reading! The first six are all good. Last edited by Ralphy; 05-26-2011 at 06:52 PM..
Doms pic on page 2 shows it pretty well. On his he added adjustment on the top arm inner the original didn't have. Nick from what I had read, I expected something more like this. That set up looks like Jag style where they use the axle as an upper arm. The Watts link set up is good for the forward/rear bracing. The original style has an upper and lower arm that are both independantly braced but that does require an axle(half shaft) that changes length through suspension travel. The half shafts are so short it's basically a couple of splined yokes put together. So Klaus designed a double wishbone for the 427 Cobra? Does this design incorporate toe steering like the Mustang I? Toe was adjustable two ways. The lower inner is on a threaded sleeve that can be adjusted forward and back for toe out/in. 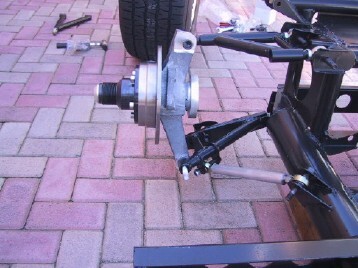 The radius rod on the lower was adjustable on length which also adjusted toe, but at the same time it affected rear caster and the wheelbase a lot so really the first method was the best toe only adjustment. I'll get some better explanation pics. Nick, maybe I'm not explaining myself or completly understanding you. I'm not refering to static toe. Klaus's design incorporated jounce steering. When load the suspension will increase negative toe and when unloaded will go positive. Actually steering the rear IRS inward through a turn. The angle of the two camber rod points is what creates the steer. The more angle the more toeing effect, being able to increase or decrease the angle. So, I was wondering if the 427 Cobra design pictured had the same ability? My understanding is that the original did. Here is another with an interview with Klaus Arning. Last edited by Ralphy; 05-29-2011 at 08:37 AM..
Short answer is yes, Dom's photo you are looking at is set up in Klaus' manner. Looks to have the same pickup points that will allow jounce/rear steer. the exact opposite effect w/the front pickup point further outboard than the rear. play/measure effects on the real deal. "It's not about getting from point A to point B. It is the point"
Last edited by krausewich; 05-29-2011 at 10:00 AM..
never had a real one to verify ,but from what i've read over the years, the 427 cars were supposed to be 93" wheelbase , that forward link was sposda be longer, but it woulda landed into your back, so it was shortened up, to clear the seats when the 3" was taken out of the wheelbase. shirly someone out there has actual specs of the pickup points on the rear to run thu a spension anilizer. In Arning's graph he shows toe/steer in degrees by angle. Or tenths of a degree. However a more practical chart to me would be degree of toe by inches of travel at the wheel. Does anyone have these numbers maybe? The type of driving would change the numbers I'm sure! Last edited by Ralphy; 05-31-2011 at 06:02 AM.. I have a 7000 series suspension for sale, I will through in the leaf springs with the purchase. Please look at the items in my ads. Last edited by tnewland; 05-31-2011 at 08:45 AM..
My hard drive crashed at home. Luckily, all my 289 drawings I had at work but the 427 pdfs someone sent me a few years ago perished. I don't remember who sent them to me but is there anyone that could send me a set?